The Puffy Blowhog (フーセンドックリ?, lit. : "Balloon Tokkuri") is an enemy in all three Pikmin games. It is the more recognized of the two airborne blowhog species, although much more rare than the one introduced in the second game, the Withering Blowhog. It floats gently in the air, and when it finds Pikmin or leaders, it blows them away with a strong gust of air. Before blowing air, it first needs to stop and inhale. 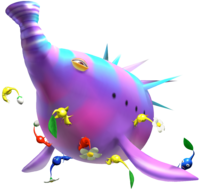 In Pikmin, this creature knocks down Olimar and blows away Pikmin, causing their flowers to wilt. In Pikmin 2, its breath is notably stronger than that of the Withering Blowhog but weaker than that of Puffy Blowhogs in Pikmin, and it does not cause Pikmin flowers to wilt, nor does it knock them back as far. Purple Pikmin are immune to the wind, and collecting the Rush Boots makes the leaders immune too. Regardless of game, their strong gusts can knock Pikmin into hazards or other dangers. It floats high in the air, but low enough for thrown Pikmin to reach, however. It can shake Pikmin off, but if overwhelmed and weighed down, it'll be brought to the ground, and be vulnerable to attacks for a few seconds. It will then attempt to go back into the air, but if it has too many Pikmin on it, will not succeed. In Pikmin 3, it can instantly inflate when it crashes on the ground, throwing off latched Pikmin. It also drops a corpse in Pikmin 3, after it deflates itself from defeat. In the first game, they appear in The Distant Spring, usually near water and other enemies, making them much more dangerous, as there is an abundance of hazards for them to blow Pikmin into. Puffy Blowhogs are only rarely seen within a few caves in Pikmin 2, as well as the multiplayer stage Carpet Plain. In Pikmin 3, the Puffy Blowhog only appears in Story Mode once in the Twilight River area, as well as in the Battle enemies! version of Fortress of Festivity. The Puffy Blowhog is a large creature, resembling a half-inflated balloon. It has a striped body, with cyan and purple stripes, two small flipper-like appendages on the sides, and several harmless spikes on the back. It also has four holes on the sides. Periodically, a flash of light blazes through the creature's body. In Pikmin, the Puffy Blowhog is slightly larger than that in Pikmin 2. In Pikmin 3, it looks noticeably more balloon-like than its previous appearances. The purple stripes are slightly translucent, and appear stretched by the air inside of it, while the blue stripes seem painted-on, as they are opaque and shiny. Its corpse looks like a completely deflated balloon, much smaller than the living creature. Its eyes also seem to have changed, due to its pupils being larger and the sclera not as noticeable compared to the previous games. Artwork from Pikmin, where the Puffy Blowhog gets attacked by Pikmin. Due to their speed when flying away, these enemies are hard to combat. It is possible to throw Pikmin at it while it is moving, but hard. Instead, lure it into attacking, and while it is busy inhaling air, quickly get under it and bombard it with Pikmin. If you threw enough of them, it will eventually fall. Swarm or charge it, and it should be dead in a few seconds. If there are other enemies nearby and you can afford to leave a distraction, keep the Puffy Blowhog busy while you clear out the other enemies, so that the fight with the flying beast will be easier. In Pikmin, it moves in the air much faster, making a head-on ambush nearly impossible unless the enemy is cornered. In the second game, they're in caves often with many gates, so they can be a problem to hit when they're behind a gate. They're weaker, and a single Purple Pikmin is enough to make one fall. In Pikmin 3, Winged Pikmin can be used to swarm it in mid-air and defeat it easily, but otherwise, the strategies from the first two games work well. Seeing as they cannot make Pikmin flowers or buds wilt, leaving a group of Winged Pikmin to take care of it is normally a good idea, as the Pikmin do not need a leader to throw them in order to attack. Rock Pikmin can also drain the enemy's health rather quickly. Because it inflates when it lands on the ground, it is advised to whistle your Pikmin to you when you see that the creature is starting to fall; it will not push away Pikmin if there are none attacking it. Then, proceed to charge like normal. When battling a Puffy Blowhog in either Pikmin or Pikmin 2, there may be times when a Blowhog that is being pulled down by Pikmin that are latched-on will land on a border or ledge of some sort. The enemy will be unable to reach the programmed "ground", and stay on the obstacle and repeat its struggling animation infinitely. In The Distant Spring, the stone pathways around the UV Lamp may cause this glitch to occur, and it can also happen on the walls of sublevels in various caves in Pikmin 2, wherever Puffy Blowhogs are found. In Pikmin 3, it will merely slide off walls or use them as a ramp to get back up. 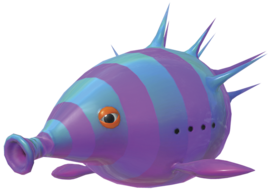 The creature belongs to the blowhog family, and the name "Puffy" is because this enemy is constantly puffed up like a balloon, and blows gusts of wind itself. Its Japanese name is フーセンドックリ?, which translates to "Balloon Tokkuri". Its scientific name is Sus inflata. Inflata is related to inflatus, which is Latin for "to puff out". Inflata is also naturally similar to the English word "inflated". Internally, in all games, this enemy is known as mar, but the meaning of this word is unknown. Italian Moschita Vacua Vacuous Fly "Moschita" possibly from "mosca" (fly) or the English "mosquito"
A Puffy Blowhog floating around in The Distant Spring. A Puffy Blowhog attacking in the Piklopedia. The creature inhaling in Pikmin 3. A Puffy Blowhog in Pikmin 2. Here, it is escaping after being attacked by a group of Pikmin. A Puffy Blowhog being attacked by Winged Pikmin in Pikmin 3. A Red Pikmin trying to pick up the deflated body of a Puffy Blowhog. A Puffy Blowhog in the rain. Side view of the Puffy Blowhog in Pikmin 3. A Puffy Blowhog in the enemy reel. The Puffy Blowhog as it appears in a prototype version of Pikmin. The creature's e-card, #18 (15th red card). In Pikmin, because the Puffy Blowhog is only programmed to shake Pikmin off when it is on the ground, if the creature is fought on top of a large enemy, like a Spotty Bulbear, it will endlessly fall on the enemy and never reach the ground, meaning that it will never shake Pikmin off. This can allow Pikmin to kill it without fear of being shaken off. The Piklopedia states that the Puffy Blowhog eats insects it finds under grass and leaves. This behavior is never shown in-game. This page was last edited on April 16, 2019, at 18:39.